The TRUE PS300 is a full body workout cross trainer designed to offer you a gym-like workout experience at home. Made from commercial-grade material, the machine is sturdy, reliable, and extremely durable. The highlights of the PS300 include Cardio 360, which allows you to target every major muscle group in the body with a set of isolated and total body training programs. You also get HRC Cruise Control, where you can set a target heart rate and let the machine adjust the workout automatically to make sure you stay in your target heart rate zone. The Multi-Grip handles are ergonomically designed to make it easier for you to target your core muscle groups. The Orthopedic Cushioned Footpads are designed to reduce the stress on your joints during intense workout sessions. These great features come in TRUE's renowned space-saving, center-drive design which puts you in the ideal position for working out. 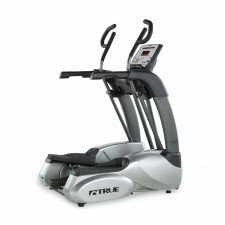 Unit Weight/Dimensions — 265 lbs; 49" x 32.5"
The Cardio 360 program and the HRC Cruise Control technology are the two stand-out features on the TRUE PS300 elliptical. They are also the two features that people are most impressed with. The Cardio 360 program allows you to work every major group of muscle in your body. It also gives you the option of working the muscles in your upper body alone, a first-of-its-kind feature which is not found even in many of the higher-priced ellipticals. The HRC Cruise Control makes adjustments on its own to make sure you stay in your target heart rate zone throughout the training session. Both these features are designed to help you achieve the highest levels of fitness and enjoy a gym-caliber workout at home. The orthopedic cushioned footpads, also found on the M50 model, prevent high-intensity workouts from taking a toll on your joints. They are also removable and easy to clean, which is something that customers seem to be very happy with. The PS300 is solidly built with commercial-grade material and can withstand years of heavy use. TRUE ellipticals are known for their durability and it is also one of the reasons why they are rated highly by users. The extended handrails, unique to this machine, and the conveniently designed side steps allow safe entry and exit from the machine. The machine comes with increased user weight capacity (350 lbs as opposed to 300 lbs on the M50 and M30) and longer warranty (seven years on parts as opposed to the standard five years). It also has an accessory tray, which is not available in the M30 and M50. Please note that the PS300 is quite similar to the lower-priced M50 in terms of features, except for the increase in user weight capacity (350 lbs as opposed to 300 lbs), the longer handrails and longer warranty (seven years on parts instead of the standard five years). So, some people might not be comfortable with paying more for the slight upgrade in features. The PS300 is a very good elliptical trainer. Like all TRUE products, it scores highly in terms of build, design, user-friendliness, and durability. It has all the standard features that you expect to see in a TRUE elliptical (Cardio 360, HRC Cruise Control, ergonomically designed handles and footpads) and has a longer warranty. So, if you are looking for a solid cross trainer with excellent features that will allow you to push yourself to the limit every time you step on it, the PS300 is a very good choice for you.